PUBLISHER: Tiger Books International plc. NOTE: Originally published 1995 by CLB Publishing, Godalming, Surrey (England). 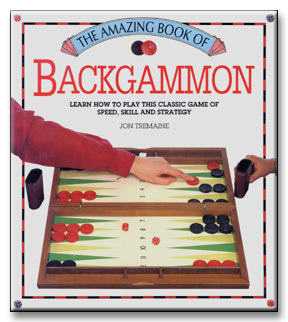 COVER: Backgammon is one of the oldest games in existence. A form of backgammon has been played for over three thousand years, and such enduring popularity proves that this is one of the world's great games. It is simple to learn and fast to play, but at the same time it is tactically complex, strategically challenging, and relatively hard to play well. It is a great gambling game, but can also be enjoyed as simple family entertainment, and the combination of skill and luck that characterizes play means that players of differing levels of expertise can sill enjoy competitive games together. This book is primarily written for the beginner, but such is the breadth of its coverage that intermediate and advanced players will also find plenty of valuable advice in it. The contents are logically arranged: first the author describes the board, the pieces, permissible moves and the set-up of the game, and he then moves on to reveal the best options for opening plays, middle- and endgames, and the most effective tactics to employ to frustrate your opponent's game plan. Demonstration games are featured to illustrate how tactics develop and change during the cut-and-thrust of play. Probably the most exciting and innovative aspect of this book is the way in which it is illustrated. Uniquely for an instructional book of this type, it features hundreds of annotated colour photographs showing move and countermove, so that the reader can follow exactly what is happening at every stage of play. A concluding chapter on gamesmanship, and how to recognize plays that an unscruplulous player may use against you, rounds off this masterly exposition of a superb game. Learn from an experienced backgammon teacher how to master the skills of this classic board game. Under his expert guidance you will soon appreciate how best to marshal your forces, and the tactical principles underlying successful play. AUTHOR: Jon Tremaine, a professional magician for over thirty years, was introduced to backgammon while performing his act in Swaziland. He has since played the game in a multitude of countries around the world, and lectures about and teaches backgammon to groups throughout the U.K. In writing this book he fulfils his wish to pass on to others the knowledge that he has gained while touring 80,000 miles a year and playing backgammon all the way! He is also the author of three other titles in this series: The Amazing Book of Magic, The Amazing Book of Card Tricks and The Amazing Book of Origami.